Is Leveling Really the Best Part of WoW? Is Leveling Really the Best Part of WoW? My accursed finances have forced me to retire my WoW account for a month, so updates here will be a mite slow. I do, however, want to cover one topic that’s been bugging me for a while. I have long stood by my opinion that leveling was the primary draw in WoW. Seeing things and always having that carrot on the stick ahead of you of one more level that drove me forward. What was there to do at the level cap? I would be bored as hell. Well, with Gav coming up on a year at level 80, I have done a solid 180 on the matter. When I play one of my lower level toons like Budman or Lug, I basically have one option: leveling. With Gav, when I log in I have a spread of things to do that I can pick and choose from at will. Do I want to work on my rep? Do dailies? Run a Heroic? Queue for Wintergrasp? Maybe I just want to play the auction house and see what I can buy. There’s no pressure here. Gavelier’s professions are both maxed as well, so I don’t have to level them either. It’s led me to change my stance on the whole leveling process. I simply don’t look forward to having to slog another toon through 30-60 more levels to get to the cap. Even Gleave’s XP shoulders aren’t helping allot. What’s the answer? Don’t have one. I can’t say, ‘ this is the cure, let’s tell Blizzard,’ because I’m not sure there is a sure-fire cure. 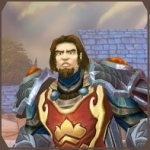 I saw one person comment that you should be able to ‘apprentice’ one of your lower level toons to a max-level character and the XP your level 80 would have earned would go to the apprentice instead. I think that that is a great idea. Will Blizzard ever implement such a feature? That’s totally up in the air. In the end, I’ll just have to drag myself – and my characters – through the low-level areas again like everyone else if I want another avatar at 80. Wish me luck.